Clark the Carver of Carve Me A Bear! 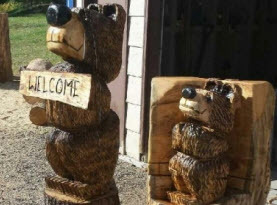 Chainsaw Carvings has been artisan in the craft of carving magnificent works of art from different wood species such as pine, redwood, ponderosa, cottonwood and other quality woods with the aid of his trusty chainsaw for the past 30 years. Receiving numerous awards and accolades, Clark the Carver is always hard at work completing many offerings of sculptures, statues, signs and more. Carve Me A Bear! Chainsaw Carvings inventory include Bears, Birds, Bunnies, Chickens, Coyote Dogs, Eagles, Horses, Lions, Moose, Owls, Lions, Parrots, Pigs, Raccoons, Squirrels, Wolves, and other intriguing subjects such as Cowboys, Garden Wizards, Indians, Mascots, Mountain Men, Mascots, Tiki’s/Totem Poles, and Furniture such as benches and tables, custom order signs, Flower Pots, Mantels, and Memorial Planters and much more! 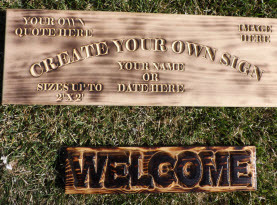 We also take many custom orders to create the unique gift for a loved one or treat to yourself. Carve Me A Bear! Chainsaw Carvings includes parrot carvings for the parrot enthusiast. With over 370 species of parrots found around the world, there is definitely an appealing specimen or two for everyone. Most parrots are native to tropical areas, but quite a few have become domesticated pets and companions with several species capable of imitating human voices and their amazing intellect. Budgerigar, or budgies and cockatiels are the most popular. Parrots feature curved bills, or beaks, and have strong legs with clawed feet. With brightly coloring and intricate patterns, parrots are known for their beauty. Some species can live for more than 80 years, relying on seeds for sustenance, as well as fruit, nectar, flowers, and small insects. In New Zealand, many of the unique breeds are native to the island, such as the kea, kaka, and kakapo. Keas are exceptionally large and among the most intelligent parrots and in the wild they are in the alpines of New Zealand’s South Island. Known for their curious and sometimes cheeky behavior, they are the world’s only alpine parrot and inhabit the ski fields where they like to investigate bags, steal small items and damage cars. Kakapos, the world’s heaviest parrot are critically endangered and as of 2010 only around 130 are known to exist. They are flightless parrots, active at night and feed on a range of seeds, fruit, plants and pollen. Parrots are often associated as loyal pets of pirates. Although there are no documented accounts of pirates having pet parrots, the stigma derived from the trade in animals from all around the world throughout the age of piracy. Pirates likely stole them along with other valuable cargo, as a colorful talking bird would have been expensive, unique, and in demand. 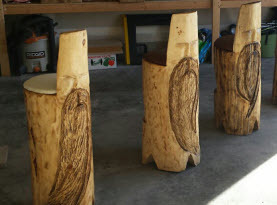 Whether you have an intrigue with parrots due to the fascination with piracy or you simply love the incredible beauty and intellectual birds and want a unique sculpture; commission Clark the Carver of Carve Me A Bear! 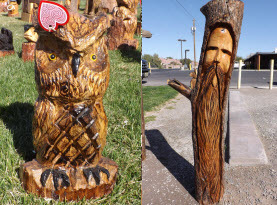 Chainsaw Carvings with the task or check out our phenomenal inventory of parrot carvings today!